Two Qassam rockets fired by Palestinians in Gaza Tuesday morning landed in the western Negev town of Sderot. One rocket landed in Begin Square, where a woman soldier sustained moderate injuries to her stomach from shrapnel; several other people suffered from shock. The second rocket landed in the yard of a private home in the city but caused no injuries. The al-Quds Brigades, the armed wing of the Islamic Jihad, took responsibility for the attack. The organization reported that it fired Quds 3 rockets as "part of a series of the organization's responses to the continuation of Israeli aggression against the Palestinian people." Sderot residents have repeatedly demanded that the government and IDF intensify the retaliation to Qassam attacks. “This situation cannot go on for long. Even prior to our evacuation (from Gaza) we warned that the mountain of rubble from our homes would be used by Palestinians to launch Qassams, and now a city in Israel is being bombarded on a daily basis from there." 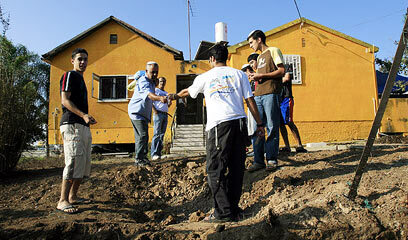 Farhan said Sderot residents are fearful of what may come next. See all talkbacks "Sderot: Woman soldier hurt in Qassam attack "